Episode 3 of Gotham starts just as one would expect, in Arabia in the year 125 AD. A masked horseman walks across a battlefield and finds what he was looking for, a soldier who had died. We see that it is the body of Ra’s al Ghul. The unknown man carries him to the Lazarus Pits and drops Ra’s in where he is reborn. This man tells Ra’s that he must find his heir as this man has found him. He hands Ra’s quite the vicious looking dagger and off we go. We next see Bruce watching Penguin’s men loading some truck from a rooftop. He notices a thief walking into a trap, trying to rob Penguin’s men. Ignoring Alfred’s warnings, Bruce intervenes and thwarts the attempt. Bruce does end up getting cut by a knife, a stark reminder that his suit may be bulletproof, but there are other dangers out there. Adding to the theme of ignoring warnings, we now switch to Jim who is ignoring Harvey’s warnings about going to see Falcone (“Jim, if you go to see Falcone, he’ll kill you”). Jim of course does go to see Falcone. He pulls up to a luscious villa straight from Scarface and immediately shares some intriguing looks with Falcone’s daughter. In Jim’s defense he did not know she was Falcone’s daughter at the time, although that probably wouldn’t have stopped him. Jim approaches Falcone and has the balls to reach out for a handshake. Obviously that is not met with a warm reception. Falcone shares with Jim that he is dying from a mysterious illness. His doctors suggested getting out of Gotham and the fresh air down south would prolong his life, so he denies Jim’s request to return to Gotham to help him take down Penguin. 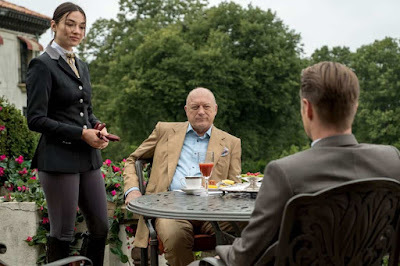 Falcone introduces Jim to his only daughter, Sophia, who volunteers to go to Gotham and help Jim. Falcone immediately dismisses this idea and says that Sophia is not ready for Gotham. Bruce, ignoring Alfred’s warnings (you’re sensing a pattern here, right? ), heads back to the docks to find a manifest. He feels that the items the thief was trying to steal from Penguin must be important. Alfred realizes that he won’t be able to change Bruce’s mind, gives him some advice revolving around the idea that he can wear different masks to accomplish goals. Bruce takes this advice and decides to pretend that his uncle is a member of the ship and that his aunt sent him there to find her. The workers let him on the ship and Bruce goes straight for the cockpit and finds the manifest. He sees that the shipment that was targeted by the thief contains an embalmers knife from the tomb of Belahsi. Seems like Ra’s has lost his knife and Penguin now owns it. Victor lets penguin know that his ship almost got robbed, but his men thwarted the efforts of the thieves. Penguin wants all of the items in his possession immediately and waddles out of is lounge. At that moment we see a mysterious woman come up to the frozen Nigma statue with a blowtorch and begin to melt the ice. Nigma wakes up to see pictures of himself all around him in some creepy shrine. His old classmate Myrtle Jenkins has become obsessed with him and planned his rescue. She lets him know that he had been frozen for 5 months and needless to say, Nigma is NOT happy that he was placed on display at penguin’s lounge. Much to his dismay, all his muscles have atrophy and he can’t move – so he must spend more time with the insufferable Myrtle. Myrtle has gotten it in her head that she will be Nigma’s sidekick, self-named a riddlette. She Dresses up in a green outfit with question marks all over it while calling Nigma ‘my love.’ Myrtle realizes that Nigma’s mind is not working correctly and that might lead to his muscular atrophy. This leads to a very enjoyable scene where she is trying to get Nigma to answer some riddles. Nigma eventually regains muscle control, knocks Myrtle out, and is on the loose. Barbara goes to penguin to try to get the knife before it hits auction. She says she has a client that wants it. Penguin is not playing ball, and tell her to come to the auction and win it herself. It shouldn’t be a problem, unless a spoiled billionaire is to get in the way. In the meantime, Bruce does some research on the knife and sees a 2000 year old drawing depicting a man being healed by water. Bruce and Alfred stare incredulously at the drawing of Ra’s al Ghul... because it is 2000 years old. Bruce decides to go to Cobblepot’s auction and just buy the knife. Before bidding on the knife he tries to dissuade suspicion by buying everything. 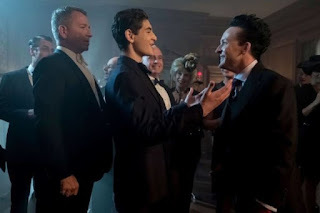 This leads to one of my favorite scenes of the season thus far, watching David Mazouz play the role of ridiculous, over-the-top, spoiled party boy Bruce Wayne. After a bidding war, Bruce wins the dagger, and Barbara is not happy to lose. Cobblepot warns Bruce that Barbara doesn’t give up easily. Later on that night Bruce gets a visit from Selina. She asks for a solid and for Bruce to give her the knife so Barbara sees her as a partner. Bruce declines and asks her to leave, further hurting Bruce and Selina’s relationship. As the episode winds down, Sophia shows up in Gotham to help Jim with his Penguin issues. She claims the city is her birth right and that she has spent the past ten years getting ready for this moment. The last scene of episode 3 features Barbara getting a visit from Ra’s al Ghul. We find out that she has been bathed in the Lazarus pit, saving her life. She assures Ra’s that they will get the knife and then they lock lips. 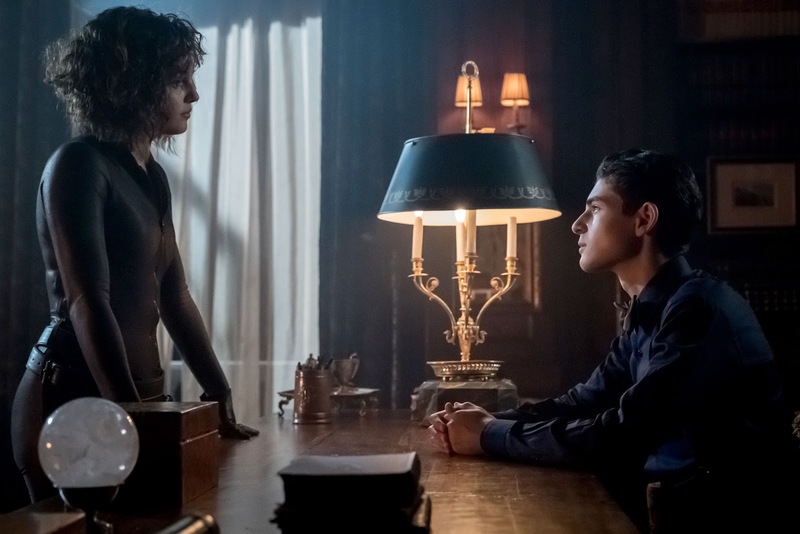 From Jim to Ra’s al Ghul, it seems like Barbara has a thing for powerful men. All-in-all, it was another solid episode of Gotham. This one was a little slower than the past few, but that was to be expected – there was no way every episode could keep up that level of action. We got a new story arc evolving featuring Ra’s dagger, and Nigma is out and about to make Cobblepot’s life a living hell. Should be an exciting few weeks coming up! It looks like next week will explore more about the mysterious dagger as well as Jim confronting Bruce about Ra’s al Ghul.